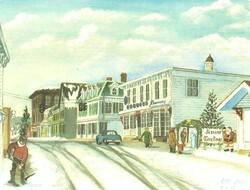 Robert Burghardt, "Malloys Corner, Stony Point"
Holiday Candlelight Tours (for information, click here). About the Image: Robert Burghardt - Malloy’s Corner, Stony Point. Printed card after an original oil, circa 1980. On the reserve of card: "From the earliest days of the community this intersection of Main Street and Route 9W had been the center of activity in the town of Stony Point. For years, space above Malloy’s Pharmacy served as the Town Hall. Malloy’s was demolished in March, 2011." We are pleased to be exhibiting several of Bob Burghardt's winter scene cards as highlights from the HSRC's collection in the "Pretty Paper" exhibition. Anyone know where I can get a print of this?